But Grothaus’ further research into reading revealed that such a transformation through reading wasn’t weird but ‘the norm for people who read a lot—and one of the main benefits of reading that most people don’t know about.” What else did he discover? Reading for pleasure can help prevent conditions such as stress, depression and dementia. Reading can offer richer, broader and more complex models of experience, which enable people to view their own lives from a refreshed perspective and with renewed understanding. Reading about other characters and situations helps you to look at life’s challenges from a renewed perspective. People who read find it easier to make decisions, plan and prioritise, because they are more able to recognise that difficulty and setback are unavoidable aspects of human life. People who read for pleasure regularly report fewer feelings of stress and depression than non-readers. Being more engaged with reading, along with other hobbies, is associated with a lower subsequent risk of incidents of dementia. People who read books regularly are on average more satisfied with life, happier and more likely to feel that the things they do in life are worthwhile. Despite reading being a solitary experience, research shows that reading improves empathy and increases social support. 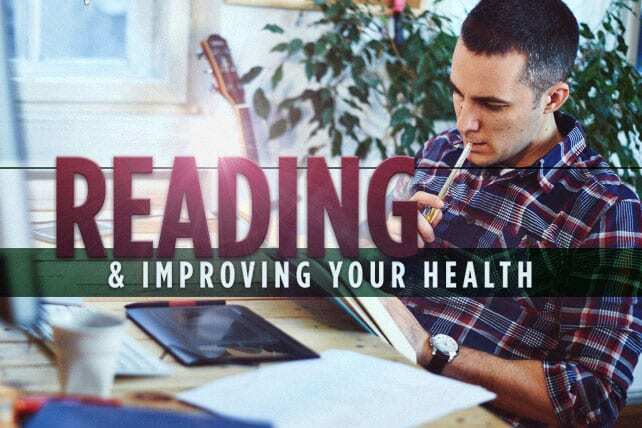 A recent survey of 1,500 adult readers found that 76 percent of them said that reading improves their life and helps to make them feel good. Grothaus goes on to give four tips on how to overcome obstacles to reading in our distracted and over-committed lives (see here). But if reading secular books can have such life-transforming benefit, how much more will a wide range of good spiritual books transform our lives and even our eternity. “From childhood you have known the Holy Scriptures, which are able to make you wise for salvation through faith which is in Christ Jesus” (2 Timothy 3:15). This entry was posted in Health and tagged health, improve, reading on April 3, 2016 by Brother.